In email marketing, the success of your messages is largely dependent on the quality of your list. In this article, I will discuss Static vs. Dynamic Lists – for instance, we will go over scenarios that are better suited for Static as oppose to Dynamic lists, and vice versa. 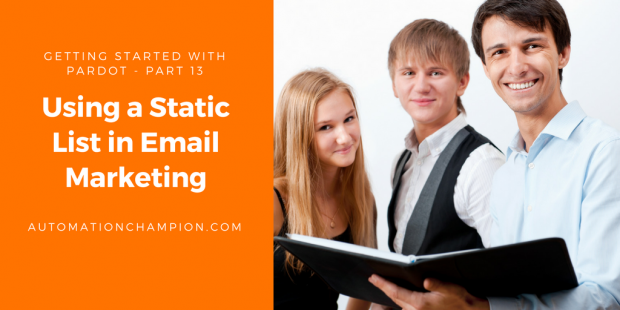 Then, I will show you how to create a Static list and use Automation Rule to add members to it. A Static list is your old-fashioned file of contacts to whom you plan on emailing to. Marketers have been emailing to contacts by using Static lists for a long time. Static lists, however, are being utilized less frequently now. Dynamic lists, on the other hand, have (for the most part) proven to be more valuable and are compliant with sending options. Static lists are usually used for emails that are sent occasionally, or only sent once. Registrants from an event, or a tradeshow, are usually on a Static list. You can use these lists when you are sending them a one-time email, or follow-up information from an event. Also, sending a monthly newsletter to subscribers’ list does not change often; unless, you want to update the list manually. Dynamic lists are best used for email campaigns in which you plan on sending emails more than once to a certain list of prospects that changes, and get updated, frequently. As time goes on, your Dynamic list would automatically adjust to your changing volume of prospects. For example, you have created a list called Current Prospect. Currently, Raj Malhotra is part of this list. You are sending marketing contents to members of this list. However, just yesterday, Raj became your customer after purchasing your services. As a result, Raj is no longer a prospect but is now a customer! Since Raj is now a customer, you do not want to send Raj a marketing email that is targeted towards a prospect. To auto remove Raj from Current Prospect list, you have to first define this list as a Dynamic list and then set criteria for membership. Let us start with a business use case. David Haditsch is working as Content Marketing Manager at GurukulOnCloud. At GurukulOnCloud, they are running their first campaign to promote their products and track activities of visitors and prospects on the corporate website. At GurukulOnCloud they are planning to organize their first Webinar. For that, they have already created a Form – How to create a Form that prospects actually want to fill out. Now, GurukulOnCloud wants to create a list and add all registrants into it so that after one week of the webinar they can send an email to them. GurukulOnCloud has also purchased hundreds of prospects from World Wide Web and plans to import the prospects and add it to the list. To solve the preceding business requirement we will use Static list. By using a Static list, it is possible to add or remove prospects automatically (Via Automation Rule, Segmentation Rule, etc,) or manually. Add Tags to organize your list. In this scenario, enter Brand Awareness as a tag. If you want to learn more about folders and tags then, refer to this article Overview of Folders and Tags. If the list will be used for internal testing, then select Email Test List checkbox. However, we are not going to select this option because we are not creating an email test list. If you want to create a Dynamic List, then select Dynamic List checkbox. However, we are not going to select this option because we are in process of creating a Static list. If you want to make your list inactive at some point in the future, then select Archive Date. Archiving lists moves them to the Archived List view on the List table in Segmentation. Archived lists cannot be used for list emails. For current scenario select Archive Date is 2019-06-22. If you want to make the list available on Email Preference Center, then select Public List checkbox. For current scenario do not select this checkbox. We will discuss Email Preferences Center option in the upcoming article. When finished, click on the Create List button to create Static List. Match All: – It will return results that match ALL of the criteria. Match Any: – It will return results that match any of the criteria. In our scenario, select Match All as we have only one rule criteria i.e. prospects submitted a form Brand Awareness. To remove rule criteria, click on the trash icon. Additionally, you can also add the criteria, and execute this automation rule only when if prospects fill a specific form, etc. To add an action, click on + Add new action button. To remove an action, click on the trash icon. Once you are done with all the changes, the final step is to click on the Create automation rule button to save the rule. Your rule will be saved in paused mode. This will allow you to complete all the components of your campaign before activating the rule. Now onwards, if any prospects fill Brand Awareness form, Automation Rule will automatically add it to Webinar Registrants list. If you want to remove someone from the list, do it manually. It is also possible to add prospects to a Static list while importing it through import wizard. In my next blog, I will take a deeper dive by showing you how to create Form Handler and use web-to-lead form to pass data to Pardot.